How Andrew Got His Spots is a children's picture book written by Louise Lintvelt and illustrated by Julie Sneeden. Andrew is an unhappy young giraffe who wishes he had spots like his parents and all the other giraffes. His fur is creamy and smooth without a spot to be seen. He visits the other spotted animals in the forest to find out how they got their spots. Each one tells him their story. The ladybug's spots were given to her by Mary the fairy, and the leopard's came in a shower of rain. Each animal reassures Andrew that he, too, will get his spots. Louise Lintvelt's children's animal story, How Andrew Got His Spots, is a beautifully written fable that's perfect for sharing with a child or as a first-reader. Julie Sneeden's illustrations are marvelous. Her watercolors are filled with natural details, and her animal drawings are accurate and very lifelike. The expressions on Andrew's and the other animals' faces are inspired as well, especially the smile on Andrew's face when he wakes and finds his spots. I found myself smiling right along with him. This is a feel-good story that could become a bedtime favorite both for children and the adults reading it aloud. Lintvelt's prose is simple, yet elegant. She never talks down to her young audience and her rhymes aren't distracting, but rather lend a lyrical tone to the book. I enjoyed How Andrew Got His Spots, even if it's been some time since I was in the target age group for this type of book. How Andrew Got His Spots is highly recommended. Andrew is a baby giraffe dealing with a "spot" of a problem. Unlike all the other animals and giraffes, he does not have a single spot on his body. His spotless, white body bothers him and he has a hard time dealing with the fact that he looks different from the others in his herd. His feelings of dejection and sadness are amplified when he sees other creatures with spots. The ways in which the others have "earned" their spots makes him confused and he wonders if he will ever be one of them. Does he stand a chance? Is nature going to be kind to Andrew? Do good things really happen when you least expect them? Will nature work a miracle for Andrew and help him feel good about himself? How Andrew Got His Spots is a perfect little story written rather poetically by Louise Lintvelt. The illustrations are very beautiful and the pictures bring the story to life. The small ditties are fun to read. The poetic touch is a master stroke that holds the narrative together and beautifully weaves images of the various acts of nature. A nice way to introduce your kids to poetry and also learn to deal with issues that they might find hard to talk about. The pictures are enough to captivate the attention of a child and the story is simple, sweet and says a lot with minimal words. Lessons about allowing nature to run its course and waiting for good things to happen without fretting too much about them are cleverly embedded in the story. Andrew is a giraffe with no spots! He is all white from his head to his toes. As Andrew looks around his herd, he is saddened when he realizes he is the only one without spots. He soon ventures on a walk. Andrew is even more upset when he discovers a ladybird, a leopard, and an owl that all have spots. Come join Andrew in his adventure in finding out when he will get spots! How Andrew Got His Spots is written by Louise Lintvelt and illustrated by Julie Sneeden. The book introduces young readers to the concept of having patience, different spotted bugs and animals, and rhymed story writing. Author Louise Lintvelt writes a unique and highly relatable cute story. For example, by using a young giraffe character, the author appeals to young readers right from the start. Children are often fascinated by young creatures and especially giraffes because of their large size. Thus their attention is kept throughout the story. 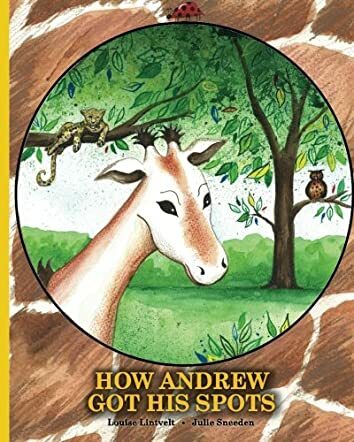 When Andrew the giraffe ventures out to seek answers to his spot questions, he again appeals to young readers because most kids are curious about nature, just like him. How Andrew Got his Spots is a fun, creative, and interesting story for young readers to enjoy in a classroom setting, library, or for a bedtime story. The text is simply written and very comprehensible. The illustrations are bright and colorful, and are sure to put a smile on a reader’s face.